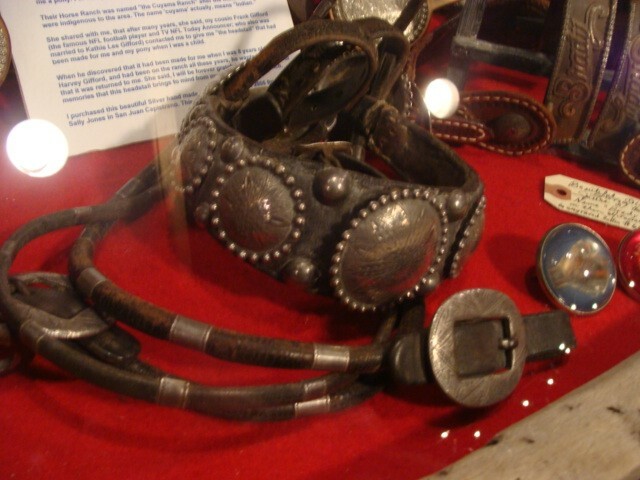 1930 Hand-made Silver Headstall by Harvey Gifford and Charlie Gifford's niece Sally Jones for her 8th Birthday in which they gave her also a Pony on their ranch near Santa Barbara, California. Her uncle Frank Gifford the famous NFL Football Player and TV Sports caster found it in the stables in 2005 and returned it to her. She was 75 then when I purchased it from her personally. 1930 Hand-made Silver Headstall by Harvey Gifford and Charlie Gifford's for niece Sally Jones for her 8th Birthday in which they also gave her a Pony. The Cayuse Ranch located near Santa Barbara, California. Her uncle Frank Gifford the famous NFL Football Player and TV Sports Caster (who was married to Kathy Lee) he found the hanging in the stables when the Ranch was being sold in 2005 and finally found her to give them to her. She was 75 then. We purchased this headstall in 2005 from her personally. The Brother's initals are also engraved on the two large side of the Sterling Silver Conchos. Please email cowboyron@cowboycabin.com with questions or call 406 270-2842.